Can Working People Be Saved From Obama’s Brilliant Plans? The first study indicates that the too big to fail banks are barely breaking even and they are getting fat and demanding on our largesse; the second study indicates that they are indeed not profitable at all. They are nothing but corporate welfare queens with a large budget to purchase politicians. Those purchases of politicians have really paid off, not a single banker has gone to jail for creating the catalyzing event of the, “great recession,” and those politicians are working hard for the banksters to prevent regulations from taking effect. The headline news is that the big banks appear to be solvent again (at least as long as nobody pokes around too much); the banking sector is pretty much back to business as usual, with large profits and great pay and bonus packages for the bankers. Wall Street profits in 2012 didn’t just rebound — they tripled. So while Wall Street is riding a wave of prosperity, the 99% who pay for their prosperity are getting screwed. Surprise! The jobs recovery is a complete and total myth. The percentage of the working age population in the United States that had a job in March 2013 was exactly the same as it was all the way back in March 2010. 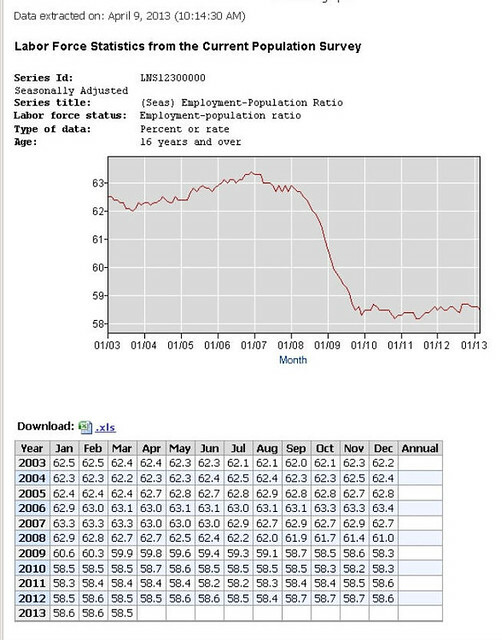 … [T]here are now more than 101 million working age Americans that do not have a job. But even though the employment level in the United States has consistently remained very low over the past three years, the Obama administration keeps telling us that unemployment is actually going down. In fact, they tell us that the unemployment rate has declined from a peak of 10.0% all the way down to 7.6%. And they tell us that in March the unemployment rate fell by 0.1% even though only 88,000 jobs were added to the U.S. economy. But it takes at least 125,000 new jobs a month just to keep up with population growth. So how in the world are they coming up with these numbers? Well, the reality is that the entire decline in the unemployment rate over the past three years can be accounted for by the reduction in size of the labor force. In other words, the Obama administration is getting unemployment to go down by pretending that millions upon millions of unemployed Americans simply do not want jobs anymore. So, it’s apparent where President Obama’s actions have been aimed. The corporate sector is awash in profits, Wall Street is going great guns and the working people get only lip service from this administration. Even the efforts that have appeared to be aimed at helping the working people seem to turn out to be a bonanza for the corporations and Wall Street. President Obama’s banner achievement, “Obamacare,” turns out to be more of a subsidy for the insurance industry than a means to get more people healthcare. Obama’s subsidies for the insurance industry just keep on coming, despite the fact that the insurance industry is the prime mover driving up health care costs. Oh, and there’s billions of dollars in Santa Obama’s bag for the pharmaceutical industry, too. Working people will get more paperwork however, perhaps the unemployed and poor can heat their homes with it now that Obama’s budget proposes cutting LIHEAP heating subsidies this winter. The economy created just 88,000 jobs in March, down from close to 200,000 in other recent months, for one main reason: The January 2 budget deal and the March 1 sequester that hiked taxes on working people and cut public spending. In the January deal, payroll taxes on working people were raised by some $120 billion. The more highly publicized tax hike on the top one percent raised less than $65 billion. The sequester added another $85 billion of budget cuts. The combined economic contraction will be about $270 billion this year, and according to the Congressional Budget Office the result will be to cut economic growth roughly in half. But the deal that Obama is trying to coax the Republicans into accepting would cut the budget at this rate for an entire decade. The economics are just insane. There is no evidence that banks are waiting to lower interest rates (which are already rock bottom) or businesses waiting to invest, pending progress on a grand budget bargain. Businesses are hesitating to invest because customers don’t have money in their pockets — and a deflationary budget deal will only make the economy worse. The poor and middle classes have shouldered by far the heaviest burdens of the global political obsession with austerity policies over the past three years. In the United States, budget cuts have forced states to reduce education, public transportation, affordable housing and other social services. In Europe, welfare cuts have driven some severely disabled individuals to fear for their lives. But the austerity game also has winners. Cutting or eliminating government programs that benefit the less advantaged has long been an ideological goal of conservatives. Doing so also generates a tidy windfall for the corporate class, as government services are privatized and savings from austerity pay for tax cuts for the wealthiest citizens. U.S. financial interests that stand to gain from Medicare, Medicaid and Social Security cutbacks “have been the core of the big con,” the “propaganda,” that those programs are in crisis and must be slashed, said James Galbraith, an economist at the University of Texas. So, President Obama has worked assiduously to cater to the interests of the 1%, has done little for the 99% and appears to be poised to screw the working people of America even more thoroughly in his most recent budget. Could it get any worse? Yes, sadly, it could. For those who have been paying attention to the debacle in Cyprus, where regular bank depositors assets were seized by the Cypriot government to “bail-in,” their big banks, you might have noticed a statement by an accidentally honest, inexperienced bureacrat that this action was a template for future actions to resolve debt crises. The statement was quickly walked back by the EU bureacracy. It used to be that the government would backstop the FDIC if it ran out of money. But section 716 of the Dodd Frank Act now precludes the payment of further taxpayer funds to bail out a bank from a bad derivatives gamble. So the next time the 1% rob us with their banks, President Obama has prepared the getaway car, put it in place and has the motor running. Can we raise some hell now?